Did you know I have become a BlogHer old timer? This didn't really hit me until people at the conference this weekend would ask me if this was my first BlogHer, and I'd answer, "Oh, let's see ... it's my fourth, and I reported on the first one, and I think that's all of them!" 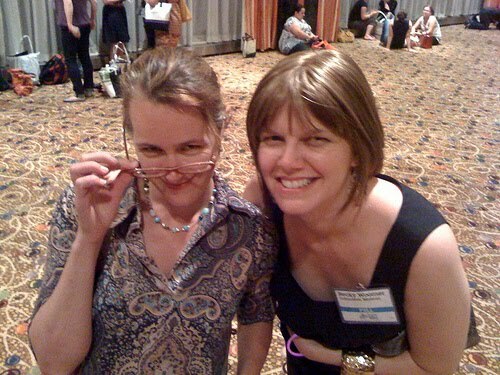 Although I enjoyed and got something out of BlogHer every year, Blogher '10 was hands-down the best conference I ever experienced. For one thing, I believe BlogHer put on its best conference ever, fixing some problems from past years and innovating some great new things. 1. I didn't bring any kids. Sorry kids, but when the daycare ends at 6 p.m. just as the parties are starting, you are a total buzzkill. Also, not that I drank so much that I performed any regrettable karaoke numbers complete with striptease, but I was able to enjoy a few glasses of wine or commemorative BlogHer cocktails (sometimes while wearing a pretty paper hat and lying on a giant cheeseburger) without having to worry about testing my breastmilk. 2. I stayed on site at the Hilton Towers. Again, this was about being carefree and enjoying evening events more. No need for a late-night commute, plus ability to drop into the room for a mid-morning nap or to dress up my outfit for evening. Last year, I'd come home from BlogHer at 11 p.m. or 1 a.m. and see that we could really use some clean towels, and end up staying up to do a load of laundry. Never again. 3. I had awesome roommates. Had I done even the slightest research on my roommates before flying to New York, I would not have been surprised to see that roomie #3, Tara, is tall, gorgeous and fit. After all, her blog is called Tall Tara and she writes about fitness a lot. The thing I learned about Tall Tara is that I'm kind of in love with her. There, I said it. She's just so warm, cool and game and hey, she's friends with Meagan Francis and Meagan is only friends with the best. All of my roommates were good sports, none were complainers, and though we all had a good time no one needed me to hold her hair while she puked. 'Nough said. 4. I met up with lots of people I already knew but don't see enough, people I wanted to know, and great people I didn't even know had existed. During my first BlogHer, I hung out with two gals I already knew the entire time. That was great because those two women are two of the awesomest women you'll meet, but at the same time, the three of us sat together and meals and didn't really give ourselves much chance to meet other people. During my second BlogHer, I went as a reporter and spent nearly the entire time chasing down people I didn't know for interviews, only getting the chance to connect with friends from Chicago Moms Blog and Wise Bread briefly. That was a great conference too, but mostly work and little play. Oh, and I could go on naming names and linking to blogs forever. Bottom line, I went up to lots of people and talked to them, and the result was rarely disappointing. I didn't act very shy. Am I outgrowing being shy, finally? Not really, but as I get older I get better at powering through it. 5. I struck the right balance between doing what I should be doing and goofing off. This is how BlogHer is: During the two conference days, there are three sessions per day where you have a panel or something talking about some Important Blog Topic, lasting 90 minutes or a couple of hours. These are bookended by opening and closing keynotes, and interspersed with breaks and of course mealtimes. I learned from my roommates that not everyone attends three sessions a day. I always have. I figure, I paid $300 to attend this conference, not to mention the expense of flying to NYC, rooming there (even at four women to a room, it wasn't cheap), and the extreme imposition I put on the kindness of my in-laws of leaving three children with them for two days before Epu could get there to help. So yeah, I went to six sessions. However, I skipped both days' opening keynotes and one day's closing keynote. I caught part of the other closing keynote, the one where bloggers read stuff they've written and the audience passes the Kleenex to one another between sobs. And I didn't attend every minute of every session. Extra-curricular activities I indulged in when I could have been doing "official conference business": got a pedicure, got a reflexology foot massage, chatted with The Bloggess in the Serenity Suite without realizing who she was, which is the perfect way to chat with someone famous, checked out the Expo and collected coupons for free products, and relaxed in my room (OK while pumping, but it was still relaxing and quiet in there). I also got the chance to do some fun things outside the Hilton like see a Broadway show, eat at the Shake Shack, peoplewatch in Central Park, eat at Le Pain Quotidienne, eat in Hell's Kitchen (which is a much nicer neighborhood than it sounds like), shop at Duane Reade (NYC version of Walgreen's), shop at the MOMA store, see a parade, and observe New York women's fashion. I went to just a couple private, off site events, but I enjoyed those I attended very much. For those not in the BlogHer loop, in recent years the most desirable events have been private parties and meals hosted by companies, to which bloggers get invited somehow or other. For me, there has usually been some kind of dinner or get-together for blogs I'm working with, like Wise Bread, UpTake or the Chicago Moms Blog, so I haven't had time to worry that I didn't get invited to such things. This year I actually had no colleagues to meet up with, but I did attend a nice brunch hosted by RedPlum and Inexpensively called Bacon, Eggs and Coupons, where (even though I overslept and showed up an hour late) I got to chat with other money-saving bloggers. So. Those are the 5 reasons this year rocked. The only negative things I can say about my weekend away are that I didn't get to meet up with either of my friends in New York, since one was in San Francisco for the weekend and one was at a baby shower in Brooklyn. Oh, and as always, I left the sessions feeling like I could have learned more. Most of the things I learn about freelance writing and blogging at BlogHer, I learn during conversations in between things. Maybe I should have spent time in the Geek Lab. Then again, maybe I did everything exactly right. Still, I think I'd better go to BlogHer '11 in San Diego just to make sure it's not possible to enjoy BlogHer even more. What a bad roomie I am! I'm just now seeing this post and didn't even have the energy to write my own post-BlogHer recap. Loved reading yours though. Thanks for the kind words. I think I'm kinda in love with you too...basically because you're awesome. But also because you were so helpful in giving me pregnancy advice and at one point, you even told me I seemed really chill about the whole pregnancy thing. Which amazed me...because I'm not feeling all that chill anymore. Anyway, it was a pleasure getting the chance to meet you ladies and y'all were really a highlight of the conference for me!